While the West has been well-acquainted with cinema of East Asia, Chinese, Hong Kong, Korean and Japanese films, Southeast Asian cinema remains exotic on the film palette, with many film watchers going for a peek into the country’s culture and psyche as much as going for the sake of watching a good piece of cinema. Thanks to the likes of Apichatpong Weerasethakul, who won the Palme D’or, Anthony Chen who won the Camera D’or and other award sweeps by filmmakers from the Southeast Asian region, people are speculating about the possibility of a cinematic ‘new wave’ from this part of the world. This is probably the starting point of Leonardo Cinieri Lombroso’s investigative journey into the films of Southeast Asia and possibly the greater social psyche that have shaped these films. Leonardo has cleanly defined the boundaries of his documentary by choosing to focus on only 1 filmmaker from each of the four countries he considers to have left sizeable footprints in the film festival circuit. As a result the world in each of the four countries is defined through the sometimes coloured lenses of the chosen filmmaker’s eyes. Brillante Mendoza offers his raw, gritty glare at social tension in the Philippines. Pen-Ek Ratanaruang, minus his earlier more earthy, localized films like ‘Monrak Transistor’ or ‘Fun Bar Karaoke’, offers a more esoteric and isolated view of Thailand in his post-‘Last Life of the Universe’ filmography. Eric Khoo offers his all-too-familiar fascination with underdog and the underbelly of society from ‘Mee Pok Man’ to ‘My Magic’. Lastly Garin Nugroho, despite defined by his strong ‘installation-art’ in his works like ‘Opera Jawa’, explains the political undertones in his works beneath all the ‘wayang’. Almost like a glimpse into the ‘workshops’ of the Southeast Asian award winning works, the filmmakers share about their respective environments that shape them and how they go about capturing the essence of their societies. Among the 4 filmmakers, Singapore stands in stark contrast to the visual potpourri that is the other 3 cities, mainly due to landscape, captured on screen, that looks regimented and barren. This is largely attributable to Leonardo’s multiple shots of tightly arranged HDB flats, some even with Eric Khoo walking through them. 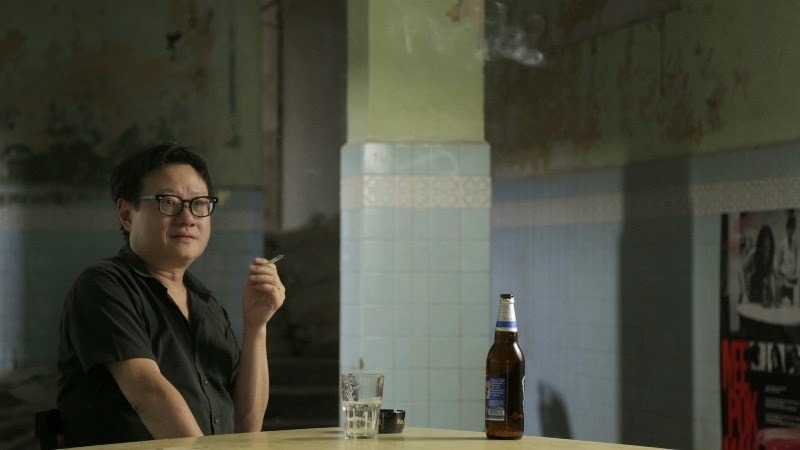 A sense of order and quietness pervades the scenes and even Eric Khoo himself sits in an abandoned coffeeshop telling us about his fascination with HDB flats that germinated the idea behind ’12 Storeys’. On deeper thought, this seemed like the Singapore ’12 Storeys’ inhabited, a little lost in time, maybe 10 years behind. Of course, Leonardo explained during the Q&A that his film was essentially offering a set of 4 windows into 4 societies, through 4 individuals, and may not represent the greater filmmaking attitudes and perspectives of the communities at large. This also brings to light the fact that making a documentary like this essentially faces the problem of coverage. The subject matter perhaps warrants a 4 part series that would do enough justice what each country has to offer. Back to the HDB shots in Singapore. These almost ‘homage-style’ shots by Leonardo, often blurred the lines between footages from the filmmakers’ actual films and the documentary itself. Even in the other cities, establishing shots of the bustling streets or rustic kampongs blend seamlessly into the actual dramatic footages from the films. Leonardo also displayed a strong meticulous hand in editing from the way he transitions between ‘fiction’ and fact and between countries. Undeniably, this act of mimicry lifts this documentary above the arms-length style of most TV documentaries and reflects the respect the filmmaker has for his subjects. Bringing back an earlier question, can we see a Southeast Asian new wave from the documentary? Ironically I think not, though it demonstrates that within each country, there are people who see stories that others can’t and want to share these with the rest of the world.